A tournament for the rest of us. Tournament Limit: 64 Players. First come, first serve so buy your ticket, bruh. This is a fun and super tactical 3-game tournament. Painted armies are not a requirement but in the case of a tie for 1st, 2nd, or 3rd place we will break the tie by which army is more completely painted and/or based. All missions include Slay the Warlord, First Blood, and Line Breaker rules. 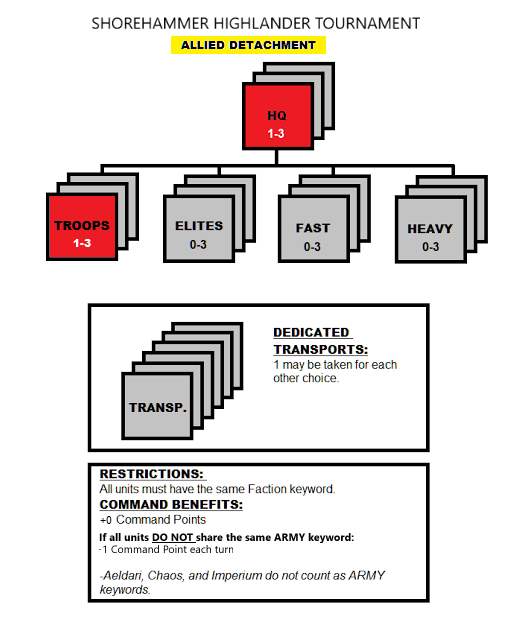 All armies must follow this Force Organizational Chart. IMPORTANT Players do not start the game with Command Points as in normal games. Instead, at the beginning of each Battle Round, both players earn additional Command Points that do not accumulate between turns. At the end of each Battle Round, all Command Points are erased and new ones generated at the start of each game turn. (See detachments below for how to earn Command Points). Pre-game Stratagems may used prior to the game turn, but are taken from the Command Points that would be generated at the start of Turn 1. 1 Main Detachment and up to 1 Allied Detachment may be taken per player’s list. The same list must be used all three rounds of the tournament, this includes Warlord Traits, Relics, and Psychic Powers. No Forge World Units are allowed. All current FAQs and the beta rules will be used. 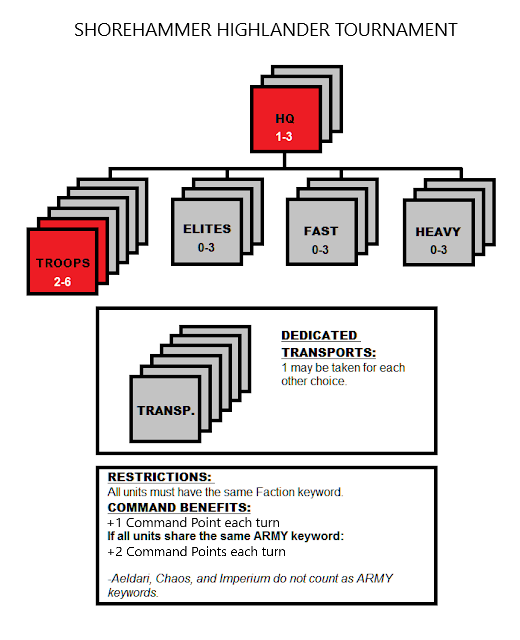 The Prepared Positions Stratagem will only be 1 Command Point for this tournament. After the 2nd Game, total points will be tallied. The top 40% of players will enter the Heavy Weight Circuit for the Title Belt and 2nd, 3rd Place Trophies. The bottom 60% of players will enter the Cruiser Weight Circuit for 1st, 2nd, and 3rd Place Trophies. All player points will be halved prior to the 3rd game (yes, even if it becomes a decimal). The points you score in the final game will be added to your existing points to determine what place you end up in. Third Game: 2 Relics on Center Line, 1 Relic in each Deployment Zone. Relics are a type of objective, so all references to “objectives” refers to both stationary and Relic objectives. A unit may not hold more than 1 objective at a time. Every objective is worth 3 points at the end of the game, and 2 points at the end of each of your player turns. Players do not score points at the end of opponent’s turns, only the end of their own. Capturing Objectives requires you to have more models within 3” of the edge of the token (not center). At the end of the 3 games, every player will secretly give 1 point to the opponent that was the most fun to play against. IMPORTANT TOURNAMENT INFO: It has been decided that armies that do not have a codex at the time of Shorehammer will receive two benefits. 1.) Their Troop choices will have ‘objective secured’. 2. )These non-codex armies may use a Stratagem multiple times per phase (but must still spend the appropriate CPs). This is to off-set the fact that they will not have army specific Stratagems, Warlord Traits, and Artifacts. WHAT IS A HIGHLANDER TOURNAMENT? Your list may not include more than one choice from any unit entry. But see below for exceptions.Ex: No more than one unit of Tactical Marines, Obliterators, Ork Nobs, Necron Overlords, Rhinos, etc. So to take our mandatory Force Org playing Space Marines you’ll need Tac Marines and Scouts to fill your 2 Troop minimum, etc. If it is two entries for variants on the “same unit”, that is acceptable as long as they don’t share a name. Ex:Tau Fire Warriors and Breachers may be taken because they don’t share a name and are two different entries in the book. You may not take Assault Termies and regular Termies, or Venerable Dreadnaughts and regular Dreadnaughts, or Demolisher Leman Russes and Battle Cannon Leman Russes as separate squads. You must also upgrade models in the same unit differently in the case of vehicles and monsters. So your (one!) unit of Leman Russes may have one equipped with a Demolisher, one with a Battle Cannon, and one with a Vanquisher for instance. Sisters of Battle, Harlequins, Custodes, Deathwatch & Militarum Tempestus do not have more than one Troops choice, so they may bring two units of their normal Troop option. But these two units may not take the same options in the form of upgrades or special weapons. Primaris Intercessors may be taken twice if: the detachment is only Primaris units, and both Intercessor squads take different bolter options. Drukhari will choose their Obsessions as normal for those benefits, but since each Obsession only houses 1 troop unit, this army is treated a little differently. Choose your Obsession and at least 1 HQ and 1 Troop from it, you are free to take whatever units you choose from the Drukhari book regardless of their Obsession, but your Obsession only applies to applicable units as normal. Ex: You choose a Wych Cult as your army theme, and all models that benefit from that Wych Cult Obsession get their benefits. Any other units taken outside of Wych Cults receive no benefits. WHAT IS A LIGHTNING TOURNAMENT? We tally up your total points from the 3 games (see above) and determine winners. There are no “elimination” brackets to this tournament. If you set aside points for summoning, you may summon a unit that was already part of your army list, but the identical units may not be on the board at the same time. We will randomly choosing opponents for each player via random computer matching. If we draw the same opponent for you more than once, we will re-draw. Both players will roll a D6, the winner will get to choose his deployment side, and choose if he begins deploying first or second. Whoever finishes deploying their entire army first, gets a +1 to their roll to see who goes first in the first battle round, but the other player gets to attempt to seize initiative as per normal rules. Since this is only a 1250 point tournament, each game will be played on a 4-foot by 4-foot board. All deployment will be Dawn of War. Each game ends at the end of turn 4 and games will be 2 hours each. Please bring 4 printed copies of your army list to the event. Shorehammer will require one copy, and your opponents each get one copy. Lists may not be 1251 points or higher. Lists that are found to be beyond 1250 points will be disqualified. You must also bring all applicable rules-sources (codex, supplement, etc. Digital versions are allowed). We will be using the FAQs from Games Workshop that have been released more than 2 weeks prior to the event.